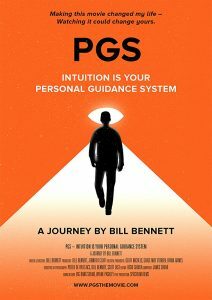 “PGS: Intuition is Your Personal Guidance System” (2017). Cast: Bill Bennett, Caroline Myss, James Van Praagh, Dr. Dean Radin, Dr. Norman Shealy, Dr. Judith Orloff, Lee Carroll, Dr. Rita Louise, Dr. Jeffrey Fannin, Michael Tamura, Paul Selig, Dr. Francesca McCartney, H.H. Pujya Swami Chidanand Saraswati, Sadhvi Bhagawati Saraswati, Foster Gamble, Kimberly Carter Gamble, Hansaji Jayadeva Yogendra, Zeyno Baran Bryza, Amanda Guggenheimer, His Royal Highness Prince Jigyel Ugyen Wangchuck. Director: Bill Bennett. Screenplay: Bill Bennett. Web site. Trailer. While on a trip to the US, veteran Australian journalist and filmmaker Bill Bennett was driving to the airport, somewhat pressed for time. As he approached an intersection, he heard a voice that told him to slow down, a suggestion that he contends he typically would have ignored under such circumstances. But, for whatever reason, this time he decided to heed the recommendation. And it’s a good thing he did: As he arrived at the intersection, an enormous speeding semi truck ran a red light at the cross street. Had Bennett continued as he had been going, he surely would have been seriously injured, if not killed, in a horrific crash. Paying attention to “that little voice in his head,” that “gut feeling,” saved his life. He was so profoundly impacted by the incident that he began obsessing about what happened. He became consumed about trying to determine where that seemingly illogical but life-saving information came from and why it came to him when it did. He soon realized that this compulsion would not leave him alone until he did something about it. And it was from that experience that he began a three-year exploration into examining and understanding the nature of intuition, a journey that led to the creation of this film. As a longtime journalist used to ferreting out the truth by gathering cold, hard facts, Bennett knew that, in the course of his investigation, he would likely come up against material that didn’t readily fit his typical reporting methods. He therefore realized that, if he were to succeed at this task, he would have to consciously set aside that preconception and keep an open mind about what he might encounter. And, based on some of the interviews he would conduct for the film, it’s apparent that some of the information he uncovered was likely far different from what he was accustomed to encountering through the kinds of stories he more typically researched. To his credit, though, Bennett stuck to his guns and put his journalistic assumptions aside as he proceeded, leaving himself open to whatever came his way. 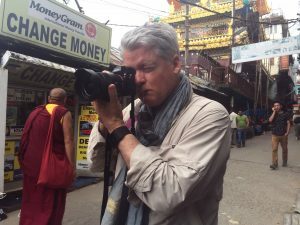 In making the film, Bennett traveled the globe, visiting places as far flung as his native Australia, the US, India, Turkey and locations in between. He interviewed a variety of experts from a range of fields, including those from “traditional” backgrounds, like science and medicine, to those more versed in the unconventional, like psychics, channelers and spiritual healers, as well as those from a variety of religious orientations. Through these conversations, the experts provide different pieces of the intuition puzzle, but, amazingly, their observations all fit together, creating a mosaic of insights, giving viewers a comprehensive picture of what constitutes this phenomenon. Most of the film’s segments open with a question, such as “How Do I Tap Into It?” and “What Stops It?” From there, Bennett explores each question and presents comments from experts for elaboration, explanation and examples. This provides viewers with an easy-to-understand format that, collectively, paints a concise yet inclusive picture of what the intuition is, how it works and why it’s important. This is especially true when it comes to understanding how we can make use of it to better our lives. Effectively drawing on the power of this personal guidance system can be employed in countless ways, from seizing upon valuable opportunities to recognizing fortuitous synchronicities to, as Bennett found out for himself, saving your life. Intuition is particularly valuable for the role it plays in the conscious creation process, the philosophy that maintains we manifest the existence we experience through the power of our thoughts, beliefs and intents. Its importance lies in its contribution to the formation of our beliefs, which, in turn, provide the basis for our reality’s manifestation. Along with intellect, with which most of us are already well (if not obsessively) acquainted, intuition provides input into shaping the intents we employ to materialize the world around us in all its myriad aspects. Unfortunately, we often tend to downplay the validity and significance of intuition in this process. That’s primarily because it’s seen as illogical and irrational, making it appear – falsely – that it’s fundamentally less reliable. It seems to lack the “certainty” we associate with the intellect, which is generally given a free pass when it comes to belief formation. But such an approach is shortsighted, mainly because it’s incomplete. Without the input of the intuition, we may miss essential nuances that are critical to making our beliefs work. Intuition frequently fills in important gaps in our thinking, providing details that might be otherwise overlooked but must be addressed as part of the belief development and reality creation processes. The result could easily be disappointment, frequently accompanied by a sense of not knowing what went wrong. One expert recommends the oft-cited example of using our intuition to find a parking space in a crowded city neighborhood. Many people who don’t claim to make ready use of their intuition nevertheless invariably insist that they instinctively know how to locate these elusive spaces, despite the odds of their availability seemingly being heavily stacked against their discovery. Even though these individuals don’t attribute their success to effective use of their intuition, that’s precisely what they’re doing when they engage in such exercises. Applying this protocol to other applications, preferably of comparable magnitude, can help intuition initiates become more practiced in their skills and aid them seeing how it can be used for a wider range of uses than simply finding parking spaces. If this is all so seemingly easy, however, why don’t we do it more readily? As noted previously, in large part, it’s due to our intuition being viewed as unreliable and untrustworthy. But what specifically drives those feelings? In most instances, it comes down to a question of fear. A number of the film’s experts cite this as something that holds us back from trying new things, particularly those that are unknown and untried and fall within the realms of uncharted territory. In many regards, that aptly defines how many of us tend to view our intuition. It’s not perceived as being as clear-cut and seemingly verifiable as the way the intellect operates, so that in itself makes it something worthy of skepticism and caution. However, while the experts understand that this is a natural reaction, they also advise that it’s an ill-considered viewpoint. They contend that intuition is infallible, that it never steers us wrong, that it always leads us to where we’re supposed to be. In fact, they caution, the only times we get ourselves into trouble come when we purposely ignore it, a practice we engage in at our peril. Thankfully, this is something that becomes more apparent the more we learn to trust – and follow – what our intuition tells us. And, once we have that down, there’s no telling what we can do with it. In compiling this film, Bennett has assembled an impressive lineup of experts, including author and medical intuitive Caroline Myss, holistic medical practitioner Dr. Norman Shealy, after-death medium James Van Praagh, psychiatrist and author Dr. Judith Orloff, and Institute of Noetic Sciences chief scientist Dr. Dean Radin. (Biographies of these and many other experts can be found on the Interviews page on the film’s web site.) In addition, Bennett does an excellent job of framing his film’s subject matter, placing it in a clear, readily accessible format, one that leaves few stones unturned in explaining what the intuition is all about. It provides both an informative and personal take on the material, bringing it down to a level that audiences can more readily relate to. Overall, it’s the kind of film that aspiring directors of metaphysical documentaries could learn a lot from. “PGS” is currently playing at special screenings in the US, the UK, Australia and New Zealand. For dates and details, check out the film’s web site. To find out how to set up a screening in the US, click here. A companion book to the film is also currently in development. There’s no doubt that the intuition exists and that it can be a valuable life tool. And now, thanks to this film, there’s a great resource for understanding how it works. The information it contains may prove invaluable whenever we approach life’s intersections, be they figurative or literal. Note: Join host Frankie Picasso and yours truly for an upcoming special edition of Frankiesense & More in which we’ll interview Bill Bennett about his new release. We’ll speak with the director about the making of this wonderful new documentary, as well as what makes the intuition so special. Watch for details about its availability on the web site of The Good Media Network.